can I just use the radiator sensor? Can I just get a 93 240 radiator with the sensor in the radiator and use that to run my electric fan? I think somewhere in this thread there is a link the a three prong sensor that would work. Has anyone done it this way? 1987 240 - Sold. Had it for 15 years. Car that turned me into a car guy. Link to my feedback thread. I actually have my wagon running with just the sensor in the radiator. The 7/9 Regina cars were run that way from the factory, with a 92/82 or 92/87 switch, I forget which. Works okay but the fan does tend to run quite a bit, even on the highway, since it's not seeing the cooler temps coming out of the radiator at the bottom. Would a sensor with a different temperature rating fix that? I'm assuming you have it on your Turbo car.... Did you notice a difference compared to the clutch fan? There seems to be mixed reviews. Last edited by holdenjp; 05-06-2016 at 11:13 AM.. The temperature sensor should ideally be placed as low in the coolant system as possible. I ship small packages/purchases on Fridays, and larger ticket items via FedEx in the middle of the week. This may have been answered already but I've got a 92+ fan and relay setup in my '91 and a 93 ECU. The ECU has E-Fan control - how do I wire the high/low ground wires to the ECU? Are the wires already there on the harness or are they not pinned on a '91 harness? Couldn't find a good image of which pins on the ECU I need to tap in to either. Based upon this wiring diagram, and looking at first page of this wiring diagram, its just a ground the ECU uses to trigger fan. Diagram shows two different wiring colors...as noted, "some models." 1993-245 AC does not work, so I put a jumper on plug for AC's high-pressure switch. AC fan works when AC-switch is toggled to AC. This is not a good fan for cooling the radiator...just something for in-town driving to allow a gentle breeze for hot summer days. So, I installed a radiator-fan from a 1985 GM A-Body on the other side; I have a radiator from a turbo Volvo, so I'm using its radiator-temp switch to cycle fan. On this 600 dollar 745 I'm running (Rex Regina until MS is installed), I don't feel like digging around under the dash for a switched power source to run the relay (that arms the circut). Soooooo, I'm looking for a switched source under the hood. The exciter actually works but might there be any others that I'm not thinking of? You can tap the sunroof at fuse 20 ... I think it's fuse 20. It's a 30-amp fuse anyway. It's on the far right of the fuse panel anyway. Soooooo, I'm looking for a switched source under the hood. The exciter actually works but might there be any others that I'm not thinking of? Where is that fuse panel again? In every700 I've had, it's at the front of the center console. AM I missing something? Not a bad option otherwise, save of the fact that my sunroof is manual. It's all good peeps. Went ahead and tapped the exicter wire. Now the fan only runs when he car is actually running. And NO DIGGING AROUND INSIDE THE CAR! 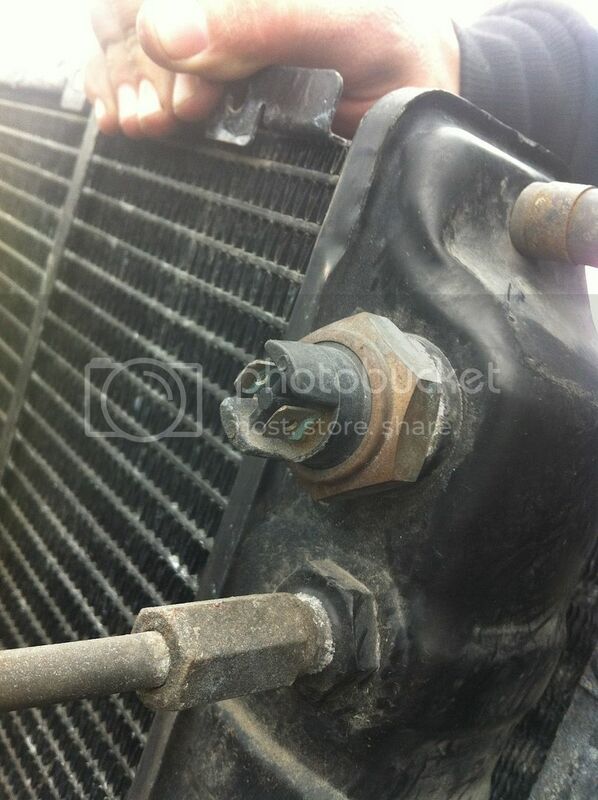 Can I just get a 93 240 radiator with the sensor in the radiator and use that to run my electric fan? That's the way I did it....I use a ground circuit thru radiator sensor, and this ground trips the relay. Relay is wired hot from the battery with a 20 amp circuit breaker on it, so fan will sometimes run when engine is turned off. Before I installed the three core radiator, I had it cleaned. gsellstr says his fan runs on highway driving, but I'm not aware of mine doing this. I have no idea where my radiator came from. Someone from Arizona stuck it in a 1984 NA, which I use to drive, and then I stuck it in a 1993-245. It flows good. Just get a set up from Mishimoto, run it off your coil, plenty of places to wire the coolant sensor, prob the best money I have spent. Last edited by iHateVolvoPeople; 07-11-2018 at 11:41 AM..